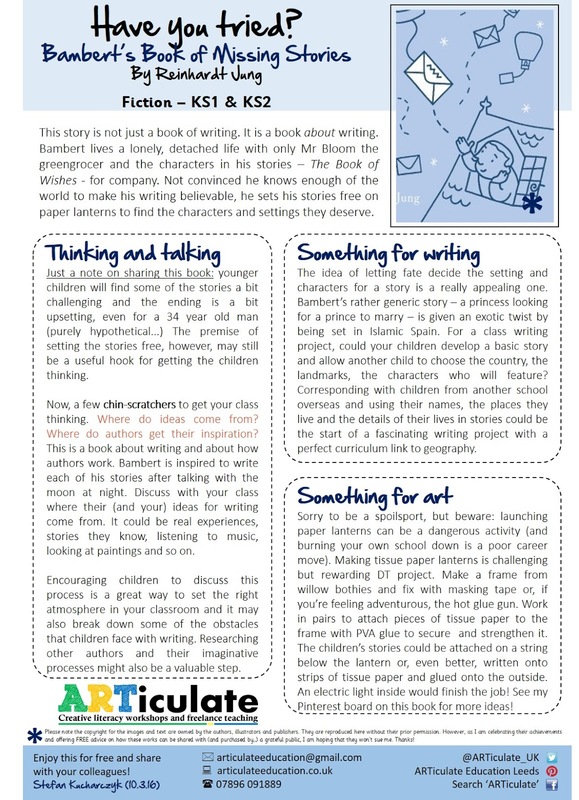 Articulate Education UK: ARTiculate Bulletin wc 14.3.16 Have you tried Bambert's Book of Missing Stories? ARTiculate Bulletin wc 14.3.16 Have you tried Bambert's Book of Missing Stories? This story is not just a book of writing. It is a book about writing. Bambert lives a lonely, detached life with only Mr Bloom the greengrocer and the characters in his stories – The Book of Wishes - for company. Not convinced he knows enough of the world to make his writing believable, he sets his stories free on paper lanterns to find the characters and settings they deserve. Ideas for talking and thinking: How do writers write? That is the question and this book gives you the starting point for a discussion about where ideas come from. Ideas for writing: Collaborate as a class or with another school on creative story writing. Ideas for art: Give your stories wings by building paper lanterns. If you try any of the ideas I'd love to see the work your children produce! A 'Have You Tried?' ideas sheet for Macbeth can be found here. To request this in pdf format, please join the mailing list by clicking here and sending me a blank email with your full name and the word subscribe.